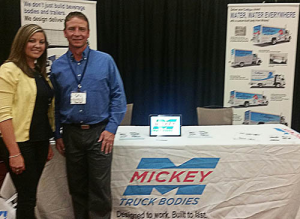 Caption: Mickey’s Steve Mason with Kourtney Tarvin-Erbes of Tarvin Culligan in Bloomington, IL at the Mickey booth during the Convention & Product Fair. Mickey’s “great partnership” with Culligan dealers over the past 25-plus was in full view at the 37th Annual Tri-State Culligan Dealers Association Convention & Product Fair in September at the Firekeepers Hotel & Casino in Battle Creek, MI. 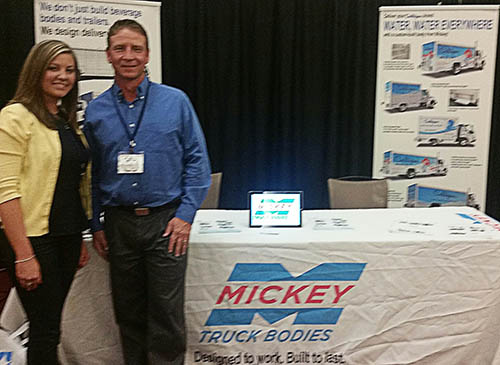 “Mickey and Culligan have enjoyed a great partnership over the years, so it was not surprising that we had an excellent turnout at our booth for this event,” says Steve Mason, Mickey’s Midwest Regional Manager. Mickey’s Culligan water body is uniquely designed and configured to transport both bottled water and 50lb bags of salt, which customers use for home water softeners installed by Culligan. “It’s a feature we’ve offered for many years and Culligan dealers use it nationwide,” according to Steve.